actually. 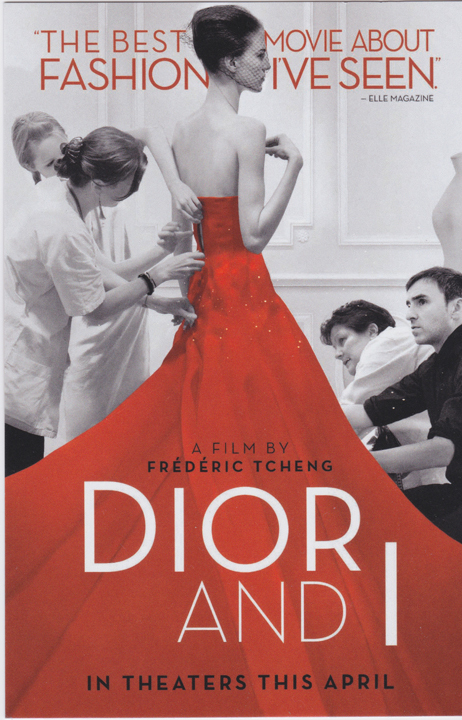 there is ONE SPECTACULAR art event happening in NYC, and that’s this film about the take-over of the legendary House of Dior – by RAF SIMONS. an absolutely superlative effort – on all levels, which makes it an artist’s film – no matter what your genre or field. or interest in haute fashion, for that matter. it’s about the creative process, the vision, the drive, co-ordinating teams of SKILLED ARTISANS, making the media buzz, keeping your backers happy, in a word: making the big dream – happen !! but beyond that general creative endorsement, it is also a film about art, how art . . ‘travels’. just as we might peruse the tabloids or the fashions pages for a mental break, RAF looks to art to get his juices flowing. his 3 favorite artists at the time of this film: STERLING RUBY, GERHARD RICHTER,and JEFF KOONS. RAF takes the time to introduce us to the drip paintings of GERHARD RICHTER, and more intensely to the recent spray paint on big canvas, all-over almost monochrome, very very moody, stormy ‘fields’ of STERLING RUBY, which he right then and there decides to custom create as a fabric for some of his floaty, but reined-in ballgowns for this his first Dior showing. and he’s got like 8 weeks to pull it all together !! so we get to see the Sterling Ruby inspiration, hitting his mindset like a lightning bolt. we get to witness a big creative leap of faith. a big big leap of faith, and we become part of the background pressure put upon the atelier, the artisans, mostly women in white lab coats – who have to make the idea come to life, have to make the Sterling Rubies transition from painted canvas to printed fabric, and yes – they come out fab. everyone is surprised and pleased. the Jeff Koons – connection ? then when he is flown over to see M. Dior’s fab fab old school estate, he sees the gorgeous flower gardens and he decides that, with that in mind – and the Jeff Koons “POP-IE” he is going to rent a huge old mansion and fill it with solid walls of fresh blooms, for the runway show – and yes he does. He must emptied out flower markets all over Europe, let alone France. spectacular. gorgeous, oh my god. so anyways, if you know your art 101 – you know PETER BRANT owns this flower puppy and he has it displayed on the grounds of his home / foundation in Connecticut. I read online he spends $75,000 a year to maintain it and keep it blooming with live flowers. imagine if he lived in LA ? he’d have to have it covered in horny succulents !! so, who do I see in line to see the next showing of ‘DIOR and I’ just as I was leaving ? I couldn’t help wondering how cool it must be to watch the movie and know you owned that piece – amazing. just ask him, if you happen to see him, out and about. he saw me. I was going to take out my camera and get in his face – but I just really really didn’t want to break the spell of a . . magic NYC moment. STERLING RUBY inspired, RAF SIMONS’ DIOR dress – as a sketch. it’s good they moved on to a stronger color palette. 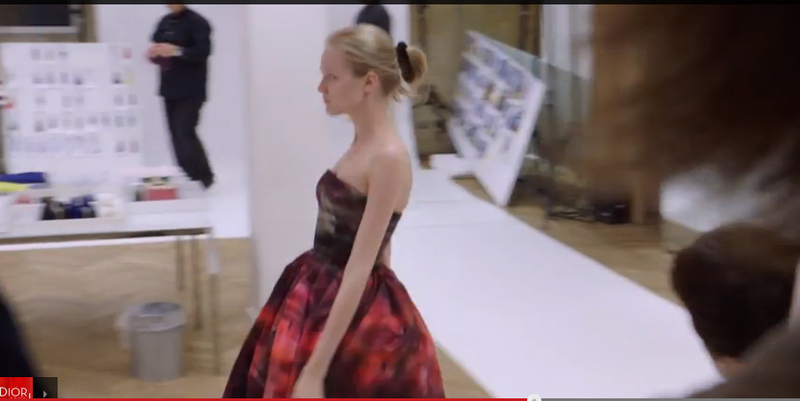 STERLING RUBY/ RAF SIMONS’ DIOR dress comes to life. the finished STERLING RUBY inspired, RAF SIMONS DIOR DRESS – in the final fitting, before it comes down the runway. the wall of flowers, inspired by the JEFF KOONS, ‘FLOWER PUPPY’ – inaugural runway show, RAF SIMONS for DIOR. images: screen grabs – from the trailer.